Aero Evo: Wait, penguins can fly!? In short, no, penguins cannot fly in the traditional sense. But they can aquafly, which is today's topic. There are relatively small numbers of flying animals that can also swim with the wings - most of these are birds, though some insects can perform this trick, as well. When the wings are used for lift-based motion through the water this is termed "aquaflight". Most aquaflying birds do also fly in the aerial sense, but penguins have abandoned aerial locomotion and use the wings exclusively for aquatic locomotion. This evolutionary transition is among the most interesting functional morphology problems in ornithology. Understanding how penguin morphology has changed over time in response to their aquaflying habits not only sheds light on aquatic locomotion, but it also gives us information regarding the constraints of aerial locomotion (which is primarily why I figured it was worth a discussion on Aero Evo). The image at left is a reconstruction (by Chris Gaskin) of Kairuku, as described by Daniel Ksepka and colleagues. The full paper is available here for free. Kairuku hails from the Oligocene. 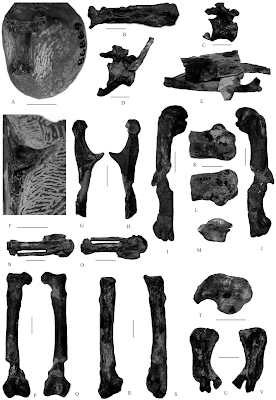 Penguins have quite a good fossil record, and we know from the record that early penguins were often quite large (Kairuku stood nearly five feet tall). 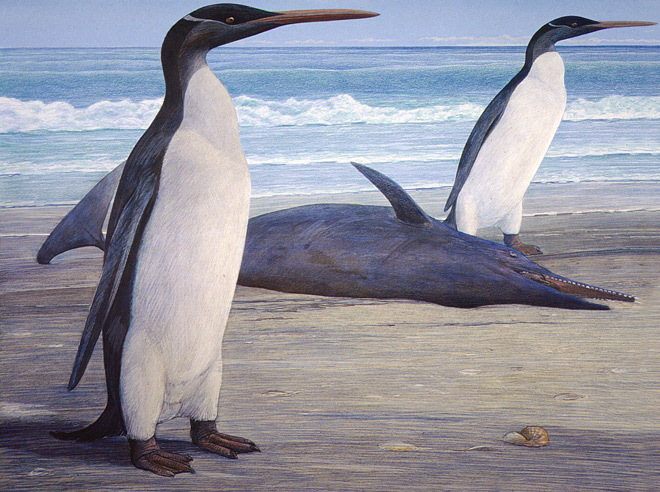 All of the known fossil penguins are also from clearly flightless animals - even early penguins like Kairuku, or the even earlier Waimanu, possessed wings clearly dedicated to swimming at the expense of aerial locomotion. However, we can deduce from phylogeny that penguin ancestors were flying animals, probably amphibious flyers (those animals that use the wings to both fly and swim). As mentioned above, there are some modern examples of amphibious flyers, and we can use them in functional comparisons with penguins (both living and fossil) to gain a better understanding of what mechanical changes have occurred in penguins. It might be expected that using the wings underwater would dominate the physical forces acting on the wings of amphibious flyers. If this were true, then the wing geometry and bending resistance of the wing bones in amphibious flyers (like puffins) should be quite similar to that of penguins. However, this turns out not to be the case. 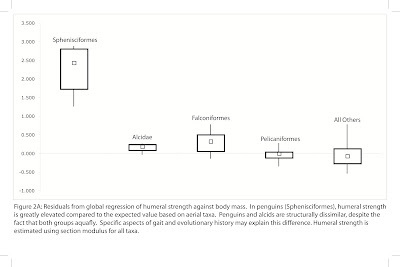 In 2010 I published a paper showing that the wings of penguins are tremendously "overbuilt", with regards to their bending strength, when compared to other birds - including other living birds that swim with their wings. One of the figures from that paper is shown at left. 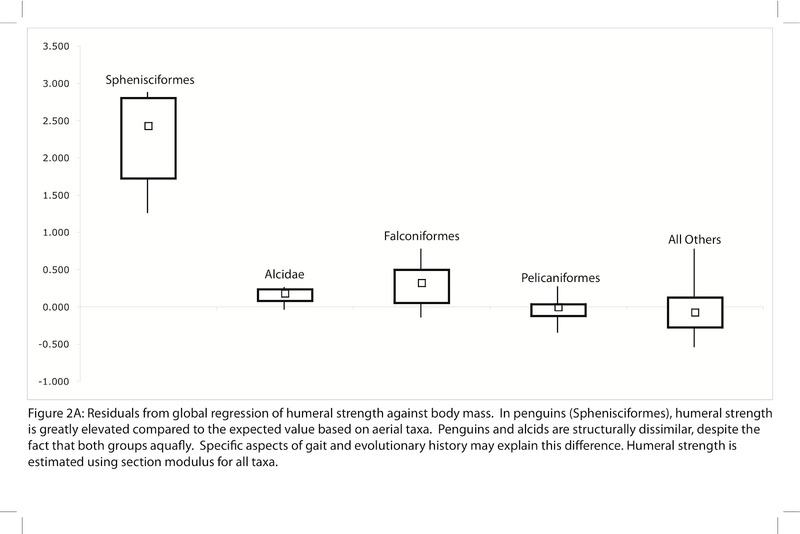 You will note that the residuals in humeral strength are much greater for penguins (Sphenisciformes) than for any other birds in the sample. Puffins and auks, which all aquafly as well, are in the Alcidae. The Procellariiformes include a sample of aquaflyers, as well. As such, penguins are unique, even among aquaflyers. In fact, this trend is not even limited to comparisons with aquaflying birds that still engage in aerial locomotion (i.e. those that "fly" proper). Last November I published a paper with Gareth Dyke and Xia Wang (available from PLoS ONE here) that described new material of plotopterids and compared the functional characteristics of plotopterid structure to penguin morphology. Plotopterids were flightless, aquaflying birds of the middle Cenozoic that were similar to penguins in many anatomical respects and which also reached large sizes (particularly in the Miocene). Some of the material we described in that manuscript is pictured at left. As it turns out, the wings of plotopterids appear to be more similar (in terms of geometric variables known to correlate with mechanical properties) to living auks than to living penguins. This implies that the swimming stroke of plotopterids was more like that of auks than penguins, even though plotopterids were flightless. There are more groups that need comparing in this way to generate a firm conclusion (Mancalline auks and Great auks, for example), but the emerging pattern is that the mechanics and evolutionary history of penguins is quite unique. Their morphology, it seems, is not just about having lost flight - it is presumably the specific trajectory by which they left the aerial realm, as well their specific phylogenetic history, that has placed penguins in a unique morphological space. In the 2010 Biological Journal paper I suggested that at least one major factor of importance may be the mirrored aquaflying stroke of penguins - unlike other aquaflying birds, living penguins produce nearly the same magnitude of lift with the wings on the upstroke and downstroke (albeit with opposite signs, of course). This mode of swimming greatly increases efficiency by reducing surge accelerations. Where this feature entered penguin evolutionary history has not yet been examined, but may be a fruitful topic of future research. The image that I have in my head after reading this is that the penguin wing is solid... ie. the bones and tissues comprise the wing and therefore this volume needs flexibility. Whereas the auk wing etc. has the feathered region which flexes, so the bone/tissue part can be more rigid. That's close, but the penguin bones are actually more rigid than auk bones - both in terms of the material properties and the geometric properties. So the penguin wing is indeed relatively more solid, but it is also more rigid. In general, though, you are on to something here - because the wing of an auk has a cambered soft tissue section that can take up some of the load elastically, it likely alleviates some of the mechanical load on the bones.